Last night the wife and I were up late watching Christmas movies (OK we actually watched Machete after realizing there nothing good on TV) so this morning would have been a highly appropriate time to sleep in before embarking on our holiday travel to see our families up north. I woke up at 7:15, however, and peeped outside through the blinds. I saw a sight that I haven’t seen in a couple weeks: a dark but promising turquoise sky! 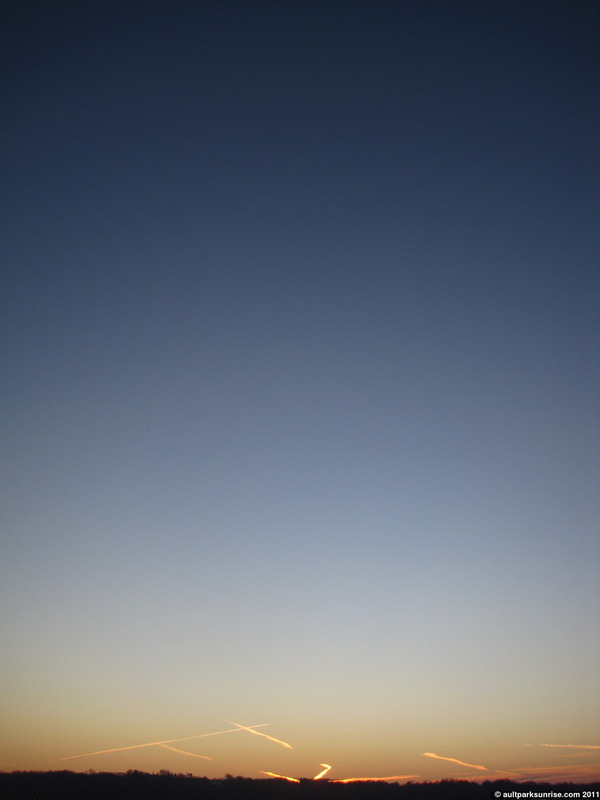 I realized that it was the first clear sky morning after a long streak full of overcast skies and wet air. Given that it was a Saturday morning, especially, I hopped on the bike and headed down to UDF for a $1 refill and was on my way. Given that I had a bit more time this morning I decided to head on down into the valley to check out Lunken Airfield’s bike trail. 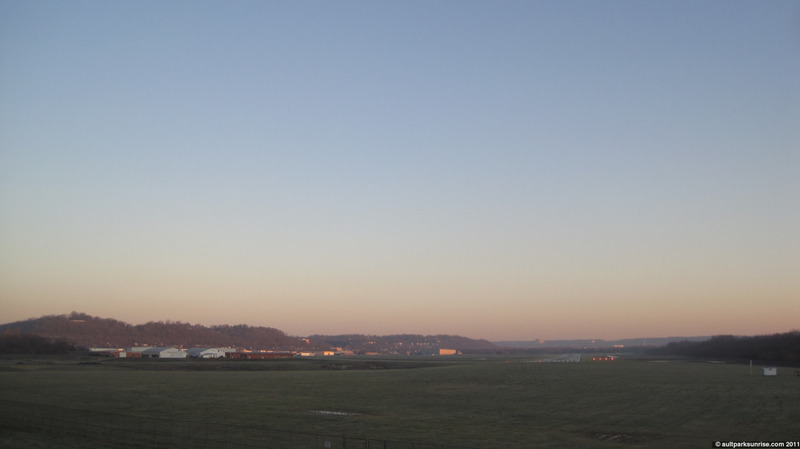 It’s a spot that I do love visiting, but it’s about a 20 minute bike ride to my favorite bench that looks out over the airfield under the open sky, so with these late 8:00am sunrises it’s a bit difficult for me to make it down there during the week and still have a reasonable expectation of getting to work on time. There was no traffic on the roads this morning, which I found both surprising because I’d expect to see holiday traffic, but also appropriate since most people are on holiday today. It was quite chilly this morning, with very high humidity and around 27F. The dew point was estimated to be roughly the same as the ambient temperature so I was actually very surprised that there was no fog. 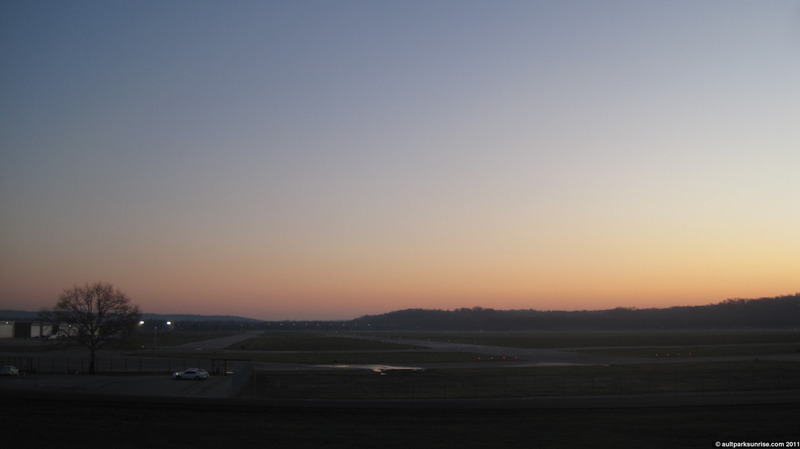 By the time I arrived at Lunken Airfield, however, I realized that the sun has drifted rather far to the right. The sun ended up being hidden behind the Little Miami River Levee for the first fifteen minutes after sunrise. I ended up getting in a nice little workout by biking around the five mile loop that surrounds the airfield. It’s a rare treat that I get to shift up higher than second gear in my bike since I tend to ride mostly along the hill sides in Eastern Cincinnati, so the quicker pace was a welcomed change to the morning routine. Although I still had to climb back up the hill to get back to Mt. Lookout! 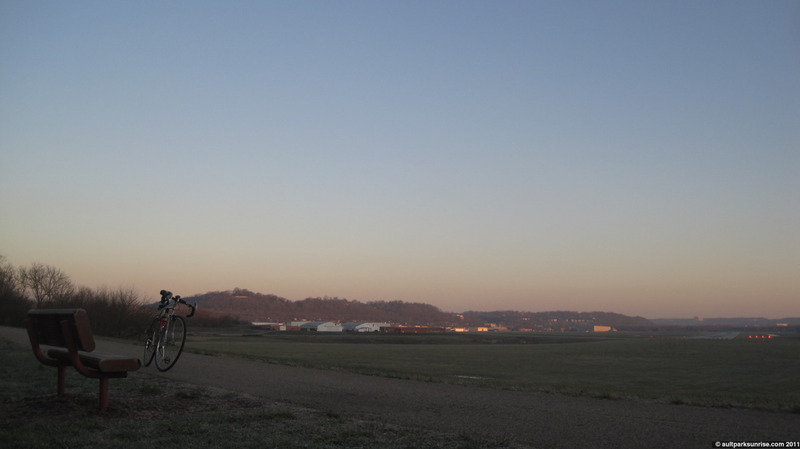 I arrived at Lunken Airfield about 15 minutes before sunrise. 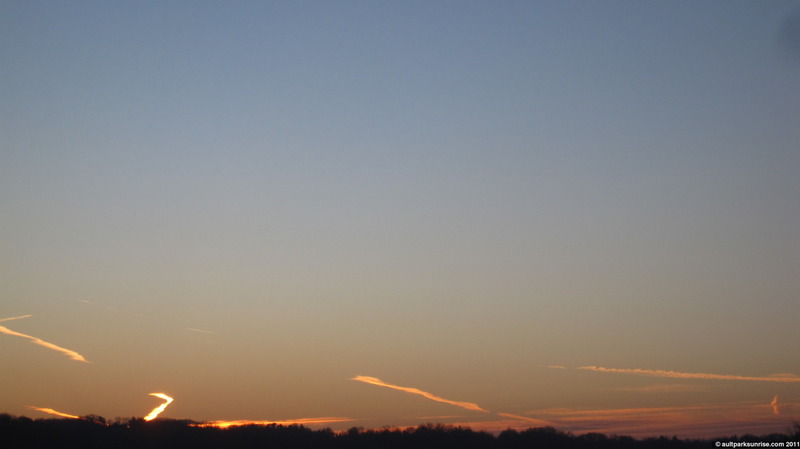 The bright aura of the impending sunrise had already faded, and the sky had lost most of its turquoise shade. 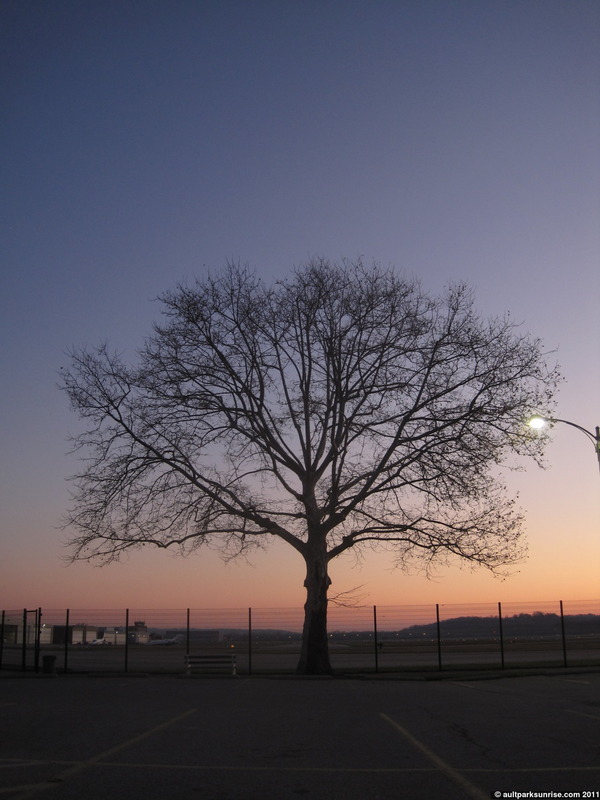 This giant tree sits right next to the air strips and is about the same height as all the other trees located on the Eastern side of the airport throughout Reeve’s golf course. I made the realization that this winter I should try to make it to the golf course at least a handful of times because where else are there such magnificent trees that stand by themselves, making the perfect silhouette candidates, than in an old golf course? The airfield is calm today with only a single plane taking off. Honestly, I would have expected more air traffic on this Christmas Eve morning. The sun is already up but we can’t see it! The highlights of the vapor trails were becoming incredibly bright as the sun popped up over the horizon behind heavily forested the Little Miami River levee. A zoom of the vapor trails. As I started along the bike trail, I noticed this secret entrance. I imagine the workers of the yard in the background use this to access the trail to get a job in after work. That’s one great thing about winter – the forest reveals many secrets that are hidden during the summer. Soon… very soon I hope to hunt down the ruins of the Mt. Adams Incline (and perhaps the Bellevue Hill Incline as well) that will no doubt be a bit easier to find with the leaves off of the trees. Looking out across the airfield. 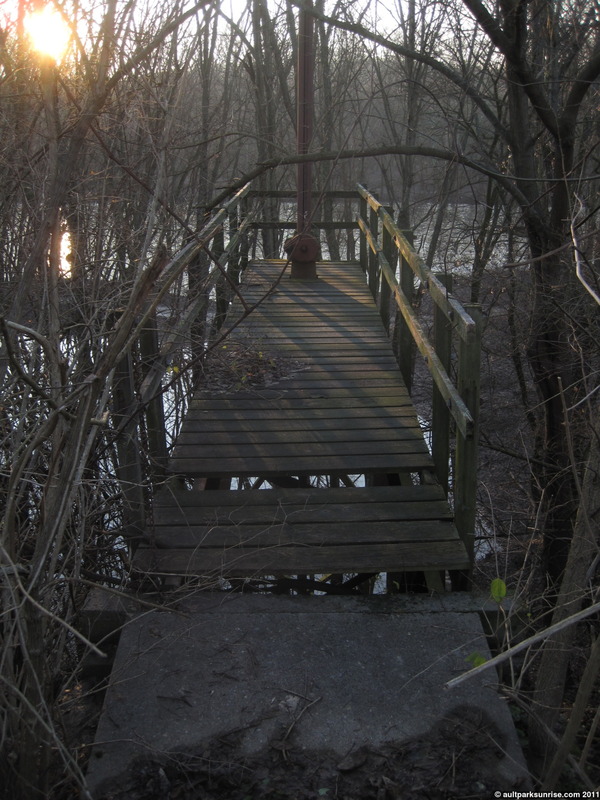 For the rest of the pictures, including the strange lock platforms at Lunken Levee, please click to continue if you’re on the front page! Deep into the bike path there is a break in the forest that exposes the airfield perfectly. There are several benches and they are aligned so that a plane taking off from the jet runway will pass directly over head. It’s a bit of a trek to get there, so I haven’t had the opportunity to actually witness such a thing, but one day I hope to get lucky. This is also a neat angle because we can see Alms Park to the left (see the white strip on the hill?) and Ault Park to the middle/right at the top of the far ridge. A close up of the Alms Park overlook. I took a moment to swing down by the river to follow up on a rumor. Over the summer a patron at Ault Park told me that there are ruins off of the bike trail of the old rail system that used to run where the bike trail exists now. I was not able to find them, but I didn’t look too hard. Apparently there are trusses from an old bridge and pieces of the old rail infrastructure. Hmm. 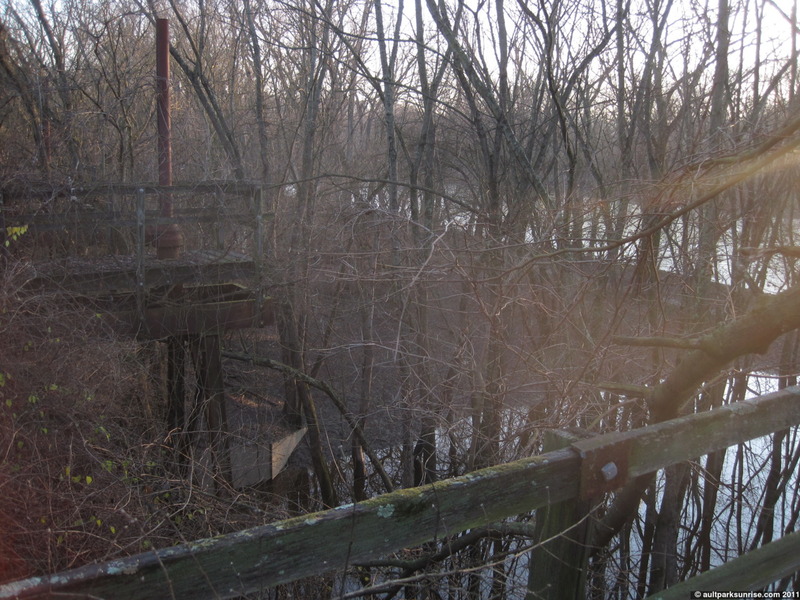 Continuing along the bike trail, I stop to check out these two strange platforms that always catch my eye. In the summer these are almost entirely hidden by the lush green leaves, but in the winter the bare bushes and trees reveal them entirely. They are obviously quite old and they support the water system, I think. Of course there are no obvious explanations as to why these exist but I do have a few clues that I’ve picked up along the way. Apparently Lunken Airfield used to be half the size that it is now, and the Little Miami River used to run right through the middle of the campus as it exists now. 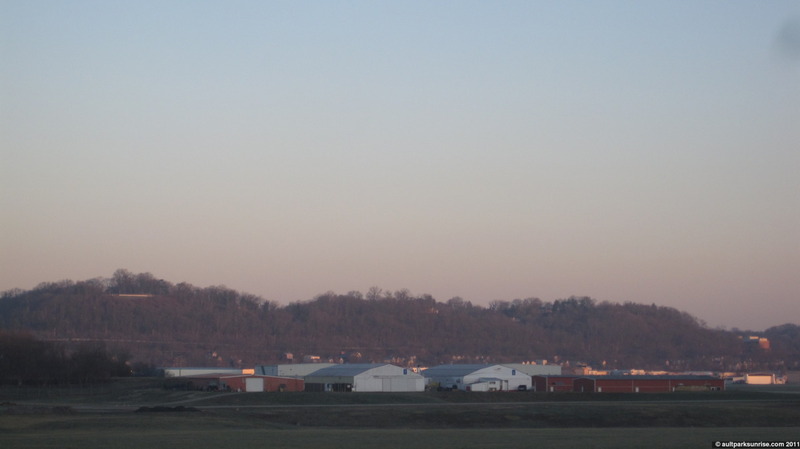 I believe the levee was built to diverge the river around Lunken Airfield to the path that it currently lies on as it makes its way to the Ohio River just a half mile away. I believe that this structure is likely part of a lock system that either was used at one time when building the Levee, or may still be in use today. I imagine the idea is that you can flood the airfield through these gates if the river is too high? That doesn’t quite make sense though because that’s kind of the whole idea of a levee. For now this mystery remains unsolved. The platform I’m standing on is actually quite stable, although I do not recommend anyone going out on it. I ventured just far enough so that I could take a picture of the river system below it. There is a second platform that is in much worse shape but this picture lets us see that the metal valve continues down below the platform into the ground below. 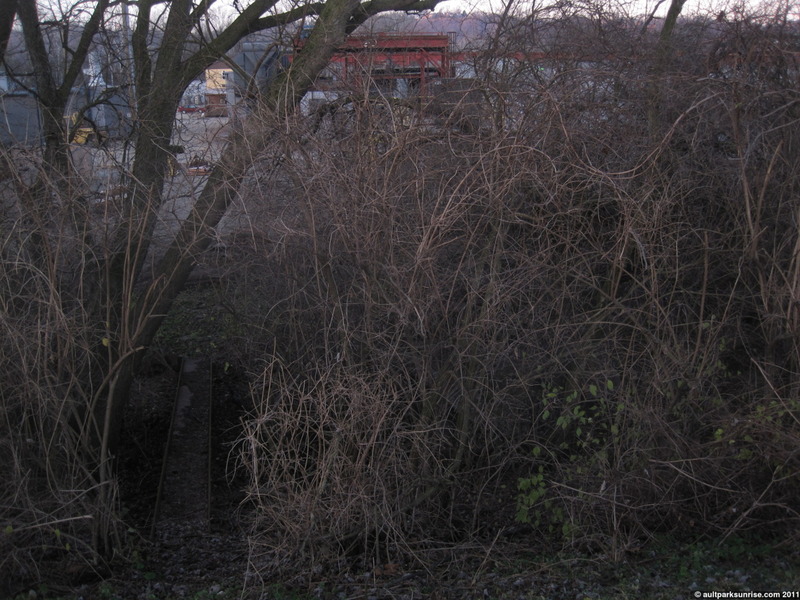 There is also a cement retaining wall and judging by the pattern of the sitting water down below that is a left over from the recent rain, the bank below the platforms is dug out to provide access to the river. Once again, I have no idea what the true purpose of these platforms are. Before heading back down around Reeve’s Golf Course, I come up on one of my main interests and something that I haven’t checked on for several months. This is the extension to the trail that will eventually connect to Armleder Park. The project was supposed to have been completed in Fall 2011, but the spring flooding pushed back the schedule. 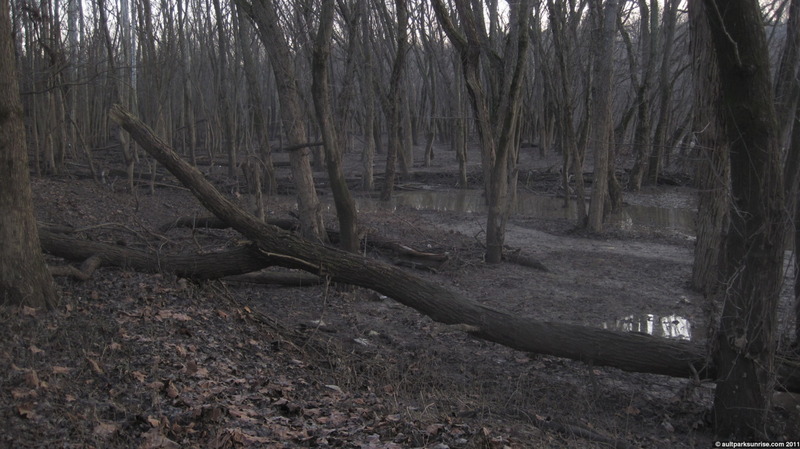 The trail is not paved yet with anything other than gravel, but I can see the wooden bridge supports off in the distance that will eventually lead under Beachmont, over Duck Creek, and into Armleder Park. As it stands the only way for a cyclist to get to Armleder Park from Lunken is either by traversing state route 32, which is not a good idea (the short way) or by heading back up through East End, and over to Ault Park and then picking up the bike and hopping over the cement viaduct in front of Linwood Public School (the long way). Either way it isn’t too convenient. This connector will be fantastic when it is completed, providing almost 8 miles of trail between the two parks. In a couple years when Lunken is officially connected to the Little Miami Trail, and then finally to Downtown Cincinnati, this will no doubt become a busy hub of activity as bike “tourists” come in from all over Ohio to access the trail systems of Kentucky. 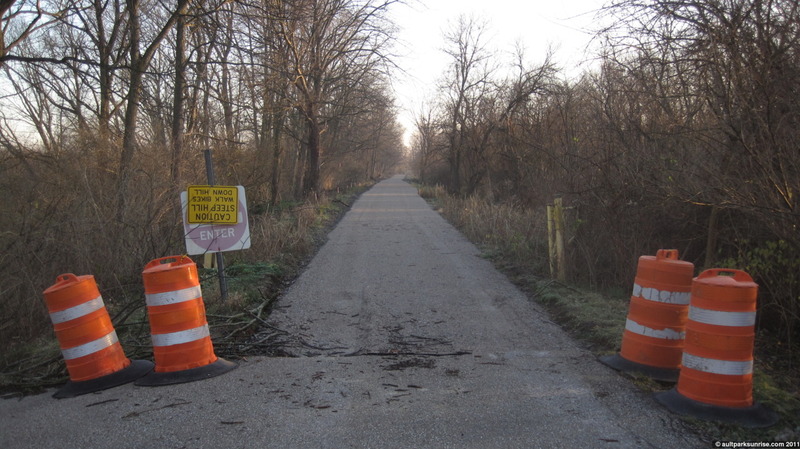 As it stands currently, the Little Miami Trail is the largest continuous paved trail in the country. In fact if I weave over to the trail head through Mariemont, I can bike to my parent’s house with very little exposure to traffic. They live almost 80 miles north above Dayton, Ohio! Merry Christmas, Happy Holidays & Happy New Year to everyone. Be safe in your travels, and if you happen to find yourself awake for a sunrise during your holiday break, take a picture and send it on over! 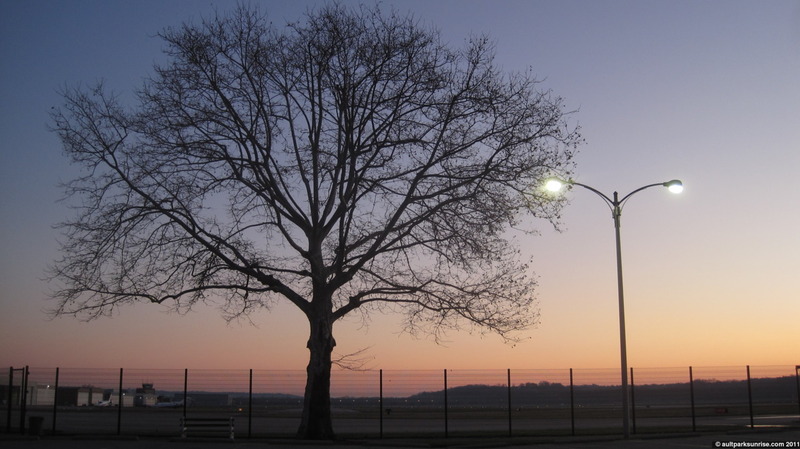 This entry was posted on December 24, 2011 by Ault Park Sunrise. 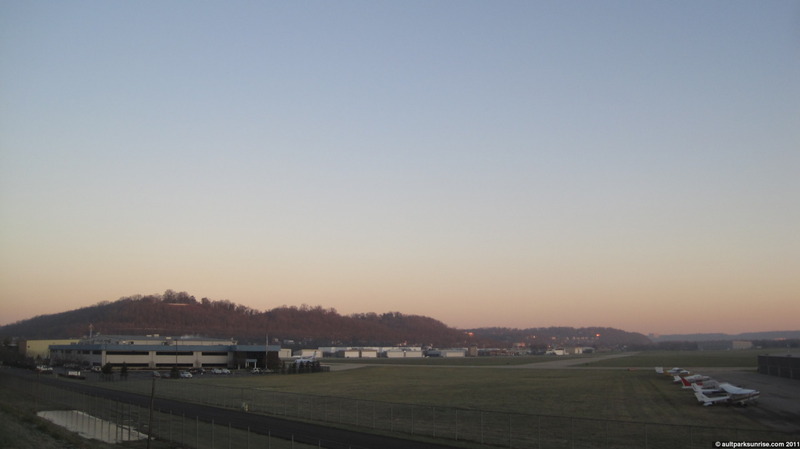 It was filed under clear skies, lunken, sunrise and was tagged with autumn, cincinnati, clear skies, lunken airfield, sunrise. Great pics, have a fabulous Christmas!